However, FINALLY, FINALLY the Telluride Aran is on the needles. I have been plotting for this jumper for about 18 months, ever since I bought the white yarn from Wonderwool 2014 that later turned out to be too chunky to get gauge. Instead, I have cast it on in some luscious Triskelion Idris DK in a colour called bootes but which I would call ox blood. Perhap bootes is Welsh for ox blood. 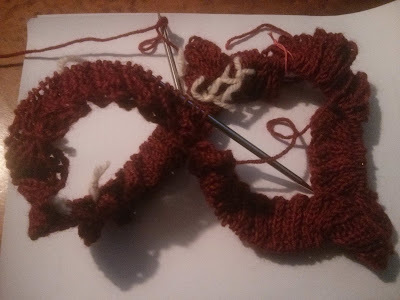 Naturally it wasn't difficult enough to run about four different cable patterns at the same time, so I converted the pattern to be knitted in the round. I've also started on a big size and will decrease to a smaller size for the top section. This seems unwise, since I have about 2 minutes of time per day to pursue any interest not involving work at the moment and it will probably take me 2 minutes to figure out where I am in the pattern. Nevermind. Better slow and right. I am hoping I can finish it before the end of the year though: this will be garment number 6.